There are a number of functions that factor on where the survey should appear so that you can target only those customers you want to survey. If you want to display the survey on a specific page, go to Survey settings > Where should the survey appear? By default, your survey will be displayed on all pages of your website. You need to choose the Display only on chosen pages option. 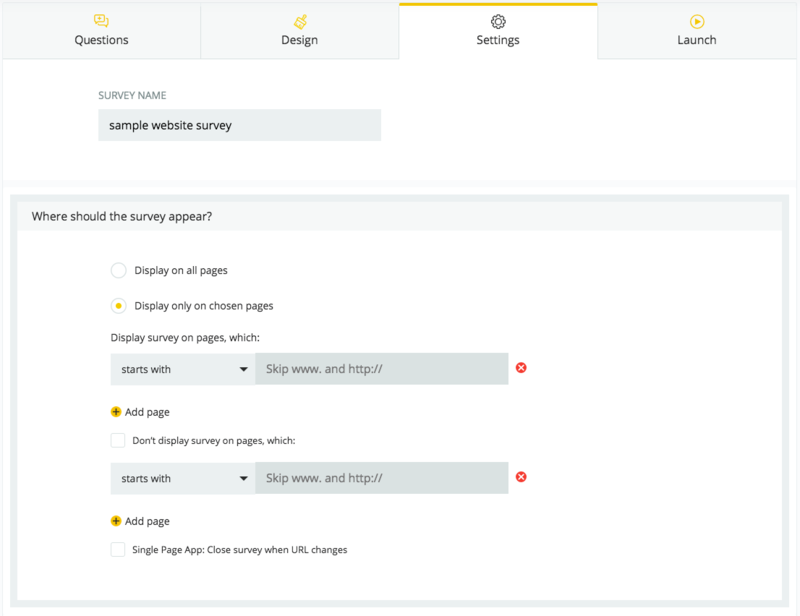 You can see two options: display survey on pages and don't display survey on pages. You can apply both conditions for one survey so that it only shows on a specific group of pages, excluding some of them. As you can see below, we have various kinds of conditions applicable to the site's URL. It's important to know, how each one works if you want to apply them to your survey. 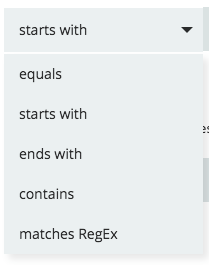 Equals lets you show your survey only on the specific page. For instance, if you want to survey customers viewing a certain software feature, or a particular product. The survey won't be displayed on any site that doesn't exactly match the URL, which means when you pick the equals condition for solutions.org/pricing/ the survey won't be viewed on solutions.org/pricing/free. Ends with lets you display surveys only on pages which have a URL ending with a specific string of characters. For instance, when you want to target people looking for a certain feature of your software you can use ends with: feature so no matter how the URL changes if it ends with feature the survey will be displayed. Contains is for displaying surveys on pages containing a particular string of characters. This way, you can, for example, target everyone visiting your /cart/ regardless of a product they've chosen or the page they came from.